In the first entry of this rebuttal, we went over two of the four videos released by bantokfomoki which attempt to refute the concept of relativistic space travel. Homing in on what he calls the apex reaction engine, an anti-matter drive used in the avatar film, bantokfomki (otherwise known as EBTX) sets forth a premise: ''If it cannot be made to work in principle, then no reaction rocket of any sort is suitable for interstellar space travel.'' Variations of this theme are restated numerous times throughout his video series. EBTXs argument is that in order to accelerate to fractions of light speed, the engines will emit so much heat that they would inadvertently vaporise themselves and whatever ship they are attached to. It is the same observation made by arthur c clarke in his book, the exploration of space, and it holds a grain of truth. While EBTX had indeed managed to prove that the ISV venture star would be inoperable under the circumstances given in the movie, that does not imply it couldn't work under a different set of circumstances (even though he frequently insists this is the case). For instance, when the ships velocity and acceleration are significantly decreased, the problems with venting waste heat are easier to manage, and mass ratios become more practical. And as for why anyone should care so much about this subject? The starship depicted in avatar is a viable merger between two of the best propulsion concepts known to science: Charles pellegrinos valkyrie, and robert forwards photon sail. If they turn out to work in some shape or form, then humanity will have a real shot at becoming a space-farring species. If you lower anything at all that resembles an interstellar engine into the sun with a magic rope, and you pull it up 6 months later, all you will have is a loop in your magic rope with a knot... This goes for any materials anywhere in the universe. There are no chemical bonds that can indefinitely withstand solar temperatures without breaking. This is true, but also somewhat irrelevant. EBTX seems to be confusing temperature with heat, which is a common mistake. The two are not the same. For example, while the corona of the sun can reach a temperature of 1 million celsius, the gas has a density of just 0.0000000001 times that of the earths atmosphere at sea level. The thermal energy of a cubic meter of corona gas is less than 0.002 joules. With that in mind, we can make some calculations about the venture stars anti-matter propulsion system. And because anti-matter is the most efficient fuel possible, we can be sure that no other type of engine would do any better. Thats tough to say for certain, since nobody knows what the ships exhaust velocity is. There are many different kinds of AMAT engines on the books, and its never stated which type is used in the movie. To proceed, we need to know what the diameter of the rocket nozzle is on the venture. From the picture, we measure about 13.5 meters. The area of the hole is Pi r squared, or 143 square meters. Theres two engines, so that gives us about 300 square meters total. The nozzle actually appears to be less than 13.5 meters across, going by this picture. Not that it really matters, given how collimated the matter stream is. The accumulated energy of the 125,000 metric ton venture star at 70% of light velocity is 2.75 x 10 24 joules. Dividing that by 15,768,000 seconds (thats six months) gives us an engine power output of 174 petawatts, which is the solar output to the earth. EBTX is rounding up the mass of the venture star, so that the energy requirements for its propulsion are equal to the solar energy received by earth. This is a useful fiction which apparently makes the calculations easier to do, although it contradicts the mass of 100,000 tons he gave in earlier videos. Now we want to know how much of the suns surface area is devoted to lighting up the earth with its bountiful energy. The surface area of a sphere with a radius equal to the distance of the earth to the sun is 2.8 x 10 23 square meters. The area of the earth that blocks sunlight is Pi r square, where r is the earths radius, at 6,371,000 meters. So the earth subtends 1.275 x 10 14 square meters. Dividing this by the other shows that the earth takes up... 2.73 x 10 9 square meters. Thats a long chain of numbers, but they are correct. The incident area of the sun comes out at 2,730,000,000 square meters exactly. Another interesting note: The sun radiates 63 megawatts per square meter at its surface, and by the time this energy reaches earth, it has dissipated to just 1360 watts due to the inverse square law. 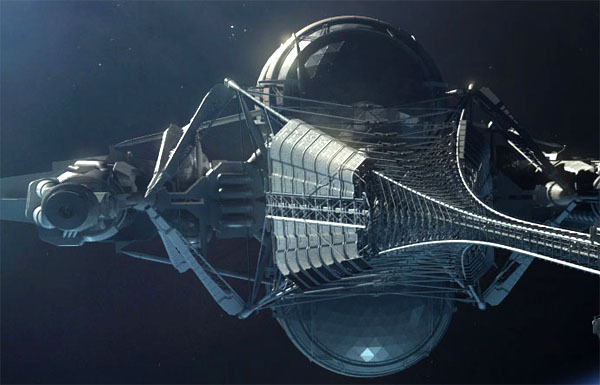 So, for an interstellar ship like that envisioned in avatar, if it had a mass of 125,000 metric tons and accelerated to .7 C in 6 months, with exhaust holes from whence comes the products of anti-matter annihilation that are about 300 square meters total, this means that the energy output from those holes are approximately 9,100,000 times hotter than the surface of the sun. Thats a very pessimistic stance to take. First, the engines are being supported by heat radiators which have a surface area at least 500 times greater than them. Dividing the 2,730,000,000 square meters of the suns incident area by the 150,000 square meters of the ships radiators reveals a difference of 18,200 fold, and not 9,100,000 fold as EBTX claimed. Second, because the engines could have an efficiency rating of up to 99%, the actual waste heat that needs to be vented into space is decreased by 2 orders of magnitude. Unfortunately, that still leaves the ship running 182 times hotter than the suns surface, equal to a blistering 1,051,596 kelvin. No matter how you twist the numbers here, one cannot help but conclude that the circumstances given in the movie are impossible to work with. 174 petawatts is way too much power for the venture star to safely cope with, since it would need to be radiating many, many times more energy per unit area than the sun does! Luckily, there is a solution in sight. We can turn back to the parameters used in the first entry of this article, which specify accelerating for 60 months up to 7% of light velocity. By accepting a significantly longer travel time (67.5 years, to be exact), we can decrease the ships power draw by 3 orders of magnitude, and get it down to just 174 terawatts. With this change to the mission parameters, the crafts temperature will have been decreased to just .182 times hotter than the surface of the sun, or 1051 kelvin. YMMV, of course. Of course, if the venture star were much lighter, the energy output of its engines will be proportionately less. So that a ship 1/10th the mass will have an orifice energy output of only 910,000 times more than an area of the sun the same size as that orifice. And a ship lighter by 1/100th, or about 1250 metric tons, will have an orifice energy output of only 91,000 times greater than that of 300 square meters on the surface of the sun. Our host is no doubt aware that decreasing the velocity by a factor of 10 will decrease the kinetic energy (and hence the energy needed to propel the ship) by a factor of 100. And that since the ship is going to be in transit for a longer period of time, its acceleration could also be decreased by a factor of 10 without any penaltys. This neatly circumvents the need to play around with the ships mass, which wouldn't work anyway, because even if you try to make a miniature venture star, the surface area will decrease in addition to the volume. Not by a proportionate amount, but more than enough to make such a strategy futile. If you understand that an engine cannot in principle sit submerged under the surface of the sun for 6 months without being destroyed, you can also understand that an engine cannot last 6 months in an environment thats millions of times hotter still. The case is closed for anti-matter engines that propel a ship to .7 C in a mere six months. So the engines must put out energy equivalent to all the energy coming out of the surface of the sun from an area of 2730 square kilometers, and it must do so for 6 months to get to 70% of light velocity. But in fact, that was being overly generous. The engines must actually output over twice that energy, or 18,200,000 times the suns output per unit area. Twice your original estimate? What will you pull out of the magicians hat next? In the rocket venue, at the beginning of acceleration, nearly all the energy is wasted out the rear exhaust, with a small amount being invested in the kinetic energy of the payload. At the end of the acceleration, and if that acceleration is some reasonable fraction of light velocity (and the exhaust velocity approximates light velocity), much more energy is deposited in the craft and less in the exhaust, simply by the nature of the energy book keeping process. EBTX is referring to the oberth effect, a phenomenon whereby the ships propellant will provide more thrust than normal after exceeding a certain velocity (since it will have a kinetic energy close to its potential energy). Its a bit like driving your car down a steep hill and gaining a speed boost because of gravity. Whether or not this is a good thing depends on just how high your starships delta-v is: Slow ships don't get to take advantage of this, but fast ships like the venture star do. With this understood, the oberth effect cannot be construed as something which forces starships to output more energy in order to attain their cruising speed. Because temperature is related to energy output in the star as 4th root, we can estimate the avatar engines temperature by its output at 18 million times the solar output. The 4th root of 18,200,000 is 65, while the surface temperature of the sun is 5778 degrees kelvin. So the internal engine temperature of the venture engine would be 65 times 5778, which is equal to 375,570 degrees kelvin. If you completely ignore the role played by the heat radiators and engine efficiency, then yes, that would be a reasonable conclusion. The stefan-boltzmann law acknowledges that the total energy radiated per unit time by a blackbody is proportional to the 4th power of its temperature. Whats less clear is how decreasing the surface area of a blackbody will affect its temperature. Will halving the surface area double the temperature? If so, then how much will the luminosity change? The devil is in the details! There are only a couple of things that can happen in the engine context when a proton and anti-proton annihilate. Of the two gamma rays formed, one must exit out the exhaust port, thats the wasted half. The other gamma ray can then go through the engine compartment, unimpeded, in which case it is useless as propellant. EBTX neglects to mention that gamma rays are merely the byproducts from electron and positron collisions: When the protons and anti-protons themselves annihilate, they produce neutral and charged pions travelling at relativistic speeds which can be magnetically deflected to produce thrust. There are various efficiency losses associated with this process, since these particles have short half lives and decay into more unstable forms, but they are not major. Its worth mentioning also that a proton is 1837 times heavier than an electron, and hence has alot more relevance in terms of kinetic energy (so this commentary on gamma rays comes off as intentionally misleading). Or it can collide with the engine compartment and thereby plasmify whatever it hits, thus contributing to the propulsion of the ship at the expense of its disintegration. Or, it can collide with the engine compartment and somehow reflect back out the rear exhaust hole, thus giving up the maximum energy of the ship without destroying it. Again, protecting the craft from ionizing radiation is not a major dilemma. We already know how to build efficient shields using a sheet of tungsten, with a v-shaped cross section to reflect neutrons and x-rays (although gamma rays are a tougher proposition). In addition, some regions of the venture star were specifically mentioned as using almost no metal, so as to reduce the possibility of gamma and x-rays ablating the hull and producing secondary radiation. A fair approximation for the venture is a cylinder around each radiator. The radiators appear to be about 300 meters long, and maybe 80 meters wide, so the effective radiative surface is about Pi times 80 times 300 times 2 radiators, equals about 150,000 square meters. The maximum temperature they can glow at is the temperature of the surface of the sun, that is they glow white hot when running for six months. Don't ask how they glow without melting, we'll just give them that. Thats a rather conservative estimate on the area of the radiators, but even so, the ship would never reach such high temperatures (assuming that the measures adopted here are viable). EBTX trys to create the illusion of impossibility by focusing on the individual problems faced by each system, and ignoring how these systems synergistically work together. If you study things in isolation, then of course the individual parts will seem absurd and inadequate. In a combustion engine, pistons are impractical without a radiator grill to collect the heat, and pointless if you don't have spark plugs to ignite the fuel. So the engine energy output is equivalent to 2730 square kilometers on the surface of the sun, or 2,730,000,000 square meters, while the radiators give off the suns energy at 150,000 square meters. This means that the efficiency of the engine is minimally, just about theoretically perfect. Or for every erg wasted as excess heat in the engine, 18,199 ergs go directly into the kinetic energy of the ship. Wow. If anyone designed the venture star in such a foolish way, then a perpetual motion machine of the 2nd kind would be in order. This rebuttal should wrap up most of the loose ends raised by EBTX and get the ball of critical thought rolling again. All in all he made some valid observations, and mapped out alot of unexplored territory, to the benefit of his audience. With that said, its interesting to note what problems didn't warrant a mention from him: Most obvious is the unimaginable cost of electricity required just to power the ship out of the solar system. Even if we meter the energy usage at the same rate as BC hydro, which is 11.27 cents per kilowatt-hour, the venture star still has a power draw of 1.4 x 10 17 watts. This means that the cost of powering it for the 1st hour alone comes out at a staggering $1577 trillion! Thats more than the entire world GDP. If you were to adopt a more modest speed regime of .07 C, that still leaves the electricity bill at $1.577 trillion. The economy would need to grow many orders of magnitude larger before such an undertaking could even begin to be considered. Heres another problem that EBTX didn't foresee. A natural consequence of the ships tensile truss is that it puts the crew habitat behind the engines, which means the exhaust flare passes within 100 meters of it on both sides. For some idea on the dangers of this engine plume, consider that a welder emits light at an intensity of around 50,000 lux (enough to damage the retina if observed for more than a few seconds), whereas the exhaust flare was described as being 'an incandescent plasma a million times brighter than a welding arc, and over thirty kilometers long.' The further an object juts out from the centerline of the truss, the more radiant heat it will be exposed to. There was no excuse not to provide the crew habitat with a cone shaped canopy for protection. Another problem is that the whipple shield stack can only offer coverage to the venture star during the departure to alpha centauri: When the ship returns to sol, the shield is forced to drag behind it, thus leaving everyone exposed to micrometeorites. EBTX - You need to put a number at each paragraph so I can refer to that specific part. For instance at 49 sec in the first video ... Why didn't you put a "(3)" so I could say "At (3) ... blah blah blah". Something like that. Actually, thats not a bad idea. I'll replace the time stamps with bracketed numbers,    etc. FYI, I have tried to take a balanced approach for my rebuttal, where I actually offer positive feedback in addition to criticism (rather than just stating the opposite of every point you make). You've put alot of work into these videos, after all, and you deserve the chance to get a point across. 1) The corona temp is irrelevant. I'm lowering it through the 'surface' of the sun' which is much cooler than the interior of the Avatar engine. Actually, as someone pointed out correctly the temperature goes as the 4th root of the energy output for a star ... so ... the actual temperature of the engine interior is around 65 times hotter than the surface of the sun. 2) I assumed an exhaust velocity of 'c' from a pure gamma ray exhaust, i.e. the perfection of rocketry. 4) Since the Venture mass is not given (by design so we can't make any engine killing calculations) ... we can choose whatever mass we like. 125,000 metric is probably still very light judging by the size of the Venture. 6) You can't send heat out the radiators because it's needed for propulsion. It must come out the nozzle. Whatever goes out by the radiator is waste. And .... most importantly ... the amount of radiation given out by the radiator cannot possible exceed the surface radiation of the sun as that would cause the radiator to melt. Hence, the amount of heat that can be radiated by those 150,000 square meters is limited to 150,000 square meters on the sun. Which in turn is 1/18,200th part of the total energy of the rocket engines ... fundamentally a meaningless amount, i.e. with the radiators maximized to white hot ... they only output 1/18,200 of the rocket's power. Not to interrupt your pace, but I have some comments about this. 1) I was using the suns corona to illustrate a point about specific heat. Things melt because they are heated sufficiently, not necessarily because of the temperature of the heat. Heat is simply a transfer of energy. Imagine a length of steel engulfed in fire. Imagine a point at the middle. If heat is transferred into that point faster than it can be radiated away, that point will eventually melt, regardless of the temp of the fires heating it. Analogy. If you have a trash can in your yard, and you are filling it with water from a hose. And the hose puts 5 gallons of water in per minute, will you be able to fill the can if there is a hole in the bottom? Whats the missing piece? The missing piece is the flow-rate for the hole. If the hole flows less than 5 gals/min, the can eventually overflows. If the hole is larger, the trash can will never fill. So you see, there is more than one factor involved. 2) That isn't necessarily what I would define as a 'perfect' engine. While it would have maximum exhaust velocity and collimation, a pure gamma ray exhaust would have a much lower thrust, and would ablate the engine alot faster. 6) If the AMAT engines are 99% or 98% efficient (which is foreseeable with room temperature superconductors), then only 1% or 2% of the energy from the annihilation reaction will need to be shed as waste heat. The rest goes out in the exhaust stream via energised particles. But even so, this still leaves the venture star running 182 times hotter than the surface of the sun! The ship doesn't work at 70% of light velocity, like you say. 12) The point of releasing gamma rays in my example is to maximize the efficiency of the engine. If mesons are sent out as exhaust, they are far less efficient and you would need a lot more fuel than that given in the example. You'd run into Tsiolkovsky's rocket equation. Remember that whatever goes out with the exhaust if waste energy. The opposite particle that actually hits the interior of the engine is what provides the payload with more velocity. Now, if a charged meson reflects off a field inside the engine and then goes out the back with its brother ... you've maximized the reaction as far as providing kinetic energy to the ship. But ... the reflecting field requires energy to be maintained against the assault of the mesons it reflects. No matter what you do, the engine can't do what it is advertised to do ... in principle. You could design one to do less ... but not nearly 70% c.
9) Yes, at least twice the amount first given. In the first video, I was too simplistic. There is no way to be more than 50% efficient in this venue. I think I explained that very clearly with the bank interest analogy. Anyway, I'm looking at ... primarily ... ballpark figures and orders of magnitude. If they matched up better, I'd have to do more explaining ... but they don't. There is no way to make the engine do what they say ... by several orders of magnitude so doubling something doesn't really matter. 10) The ship's final velocity and mass delimit its kinetic energy. Whatever that amount, and whatever the delta-v is, the greatest waste is at the beginning and the greatest efficiency is at the end of the burn ... even without taking into account the discarded propellant's mass (so the ship has less to accelerate). The reason for this inefficiency at the beginning comes from conservation of linear momentum and conservation of energy which is tied to the momentum as the square of velocity. So, twice the velocity is twice the momentum (m[2v]=2p) but four times the energy (m[2v]^2=4ke). You can pretty much discount the mass loss due to using up the propellant in an antimatter rocket because this propellant type obviates the rocket equation (you don't need much antimatter to get to high percentages of c ... if you could actually use it ... but you can't because it's too hot ... but you CAN make hypothetical calculations). 12) Oh, I thought you were suggesting using electrons and positrons as a stand alone propellent. I forgot that the byproducts from a proton and anti-proton collision eventually wind up as gamma rays, too: When the actual nucleus' collide, two neutral and three charged pions are released. The neutral pions almost immediately decay into gamma rays. The charged pions will travel 21 meters before decaying into a combination of neutrinos (carrying about 22% of the energy) and charged muons (carrying about 78% of the energy). The muons will then travel an additional two kilometers before decaying into electrons and positrons. Obviously, the types of particles that can be used for propulsion keep deteriorating into smaller and smaller quantitys. So while a method of reflecting gamma rays would be useful, it is not essential. I already touched on this in the previous article: If you use a wet mass of 100,000 tons, an exhaust velocity of 59,000 km/s, and a delta-v of 21,000 km/s, the ship only needs 30,000 tons of matter-antimatter propellant to get underway, a very comfortable mass ratio that allows lots of safety room. You can verify this with the tsiolkovsky rocket equation. And about the heat load. With rocket engines, you have to remember that in rare cases where the fuel and propellent are the same thing (such as chemical rockets, or AMAT beam core), waste heat can indeed be ejected through the exhaust. The amount you can get rid of, however, is dependent on the heat capacity of the fuel, so its not as useful with high ISP drives. I can't send replies with Yahoo mail from what I received [Reply] so I put it here instead. air. I thought of this because when hitchhiking, I found that, in still air, a 40' tractor-trailer passing at 60 mph nearly blew me backwards from the air it pushed ... and ... that air lasted about a minute. The truck was a mile down the freeway before I could not longer detect the wind it caused. the left wing spar. So ... I concluded that it was probably a smaller plane flying over the Pentagon in concert with interior explosions from set charges.